I am currently thinking about moving and getting a bigger place in Sunny Florida that has a really nice space for a Home Office since I decided to make blogging a full-time job down the line. Knowing me, I am a finder lol I love finding gorgeous things on the internet. So, of course, I had to give you guys some inspiring home office decorating ideas that are so easy to implement. 1. This gold and turquoise really complement this design. It’s nothing spectacular but by using two colours that go together you can transform your room any day. Not to mention that cute white fur chair, Gorgeous! 2. This decor is just clean and simple. I love this shelving, chairs doesn’t give it much justice but the layout is nice. 3. You can never go wrong with Black & White. This is a pretty luxurious design, but you can tone it down a bit to make it less complex. 4. This design is a rustic office design. Not gender designed, as you can see its kind of a general design that fits all. But remember, everyone has a different taste. 5. 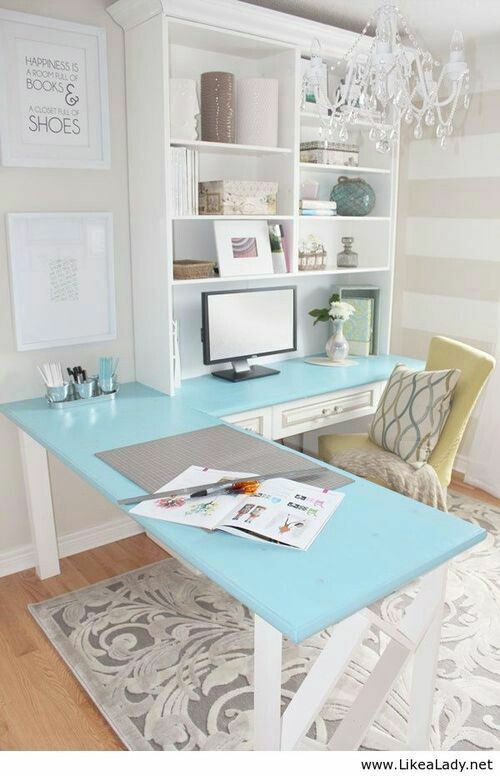 White Contemporary Home Office Design with IKEA Desk Chair and Drawer. Let me tell you IKEA is one of the best places to shop for home and office decor. If your a minimalist this is perfect for you. 6. I love how the storage options are just endless. I tend to have a lot of clutter over time, this bookshelf with multiple draws and cabins is just perfect. 7. Clean and Classic Design. 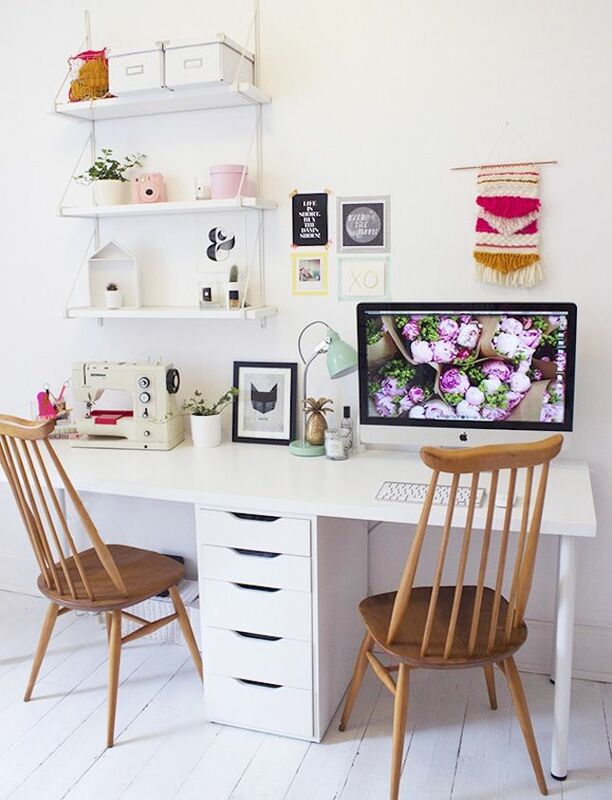 You can’t go wrong with a clean design, doing too much with colours and accessories that don’t go well together will just make your office look way too busy. 8. 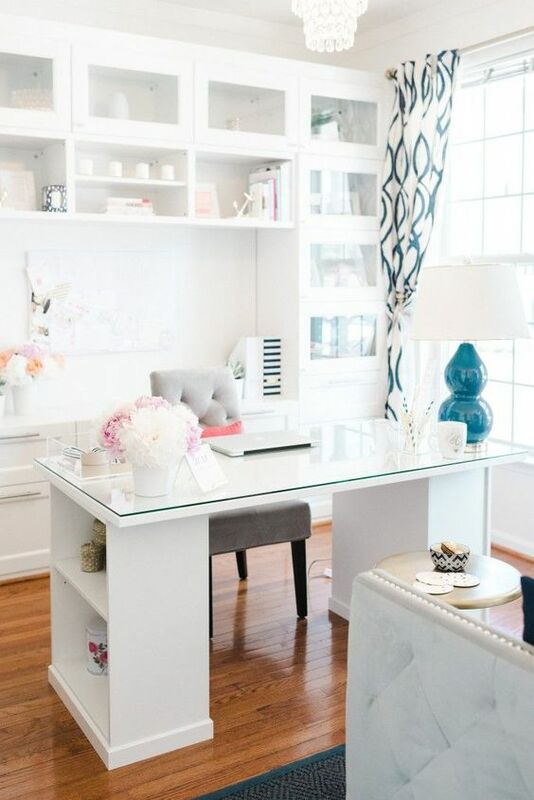 I love this desk and the chandelier the two things that actually complements this design. Aren’t these design gorgeous, let me know if any of these design inspires you to design your office. Love to hear your feedback.